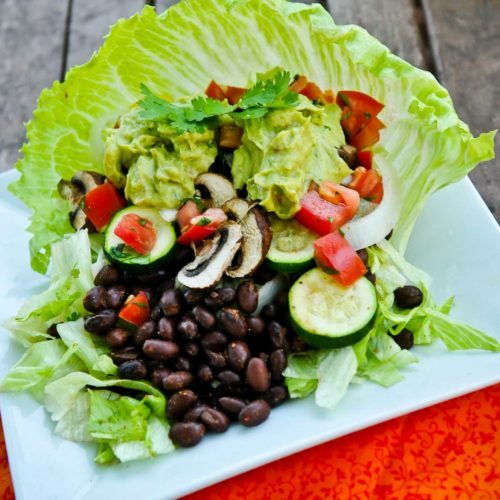 For a long time after I started really focusing on eating healthy, I refused to eat iceberg lettuce because everyone always says how it’s nutritionally useless compared to other leafy greens. Which is definitely true – leafy greens are amazingly nutritious and have a ton of different vitamins and minerals in them, and iceberg really doesn’t bring it in the same way. But then I started to feel kind of bad for it…it’s not like it’s hurting anyone. I don’t think there’s any evidence that eating iceberg lettuce is bad for you unless you eat it instead of all the other delicious greens (and admittedly, a lot of people do only eat iceberg lettuce, which is probably not great). But if you’re like me and get plenty of spinach, kale, and chard in your diet, then I don’t see why you can’t share the love with iceberg once in a while. 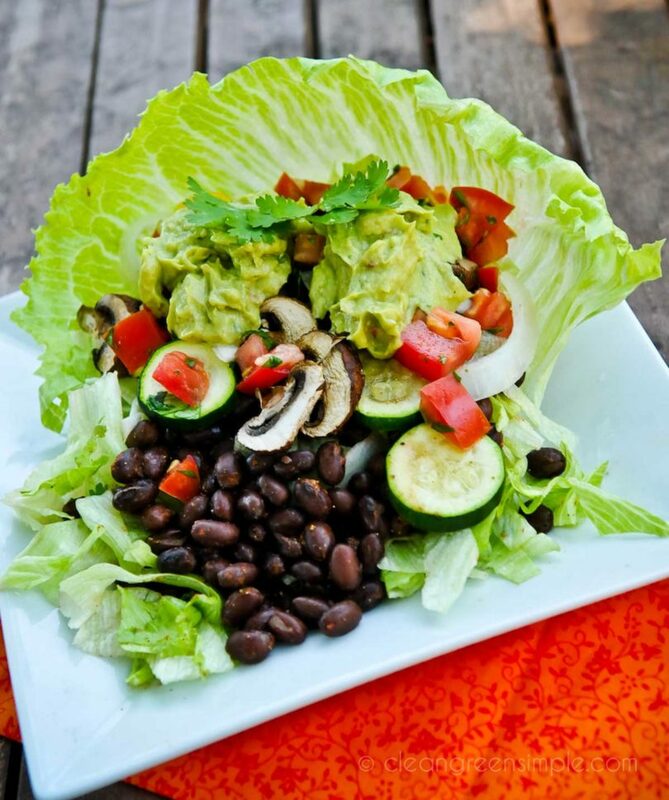 Especially if it’s in a salad with lots of other vegetables and beans that have plenty of nutrition. Also, I needed it to make this shell thing for my taco salad. I supposed I could have used cabbage but it didn’t seem like quite what I wanted for this particular meal. This is pretty easy to throw together – not super fast but not especially time consuming. Maybe half an hour – I roasted the vegetables under the broiler and everything else was ready by the time they were done. You just chop up some zucchini, squash, onion, mushrooms, or whatever good roasting vegetables you like and spread them out on a cookie sheet. You can either stick them under the broiler for maybe 10 minutes or else roast them at abour 450 for maybe 20 minutes, or until they are nice and browned. Then open up a can of black beans (pinto would work great too) and rinse them, then mix them together with some cumin, chili powder, salt and pepper. The only thing left to do is chop or tear up some lettuce. If you want to make a shell just reserve a couple of the outer leaves and set them sideways on the plate before you add the rest of the lettuce. 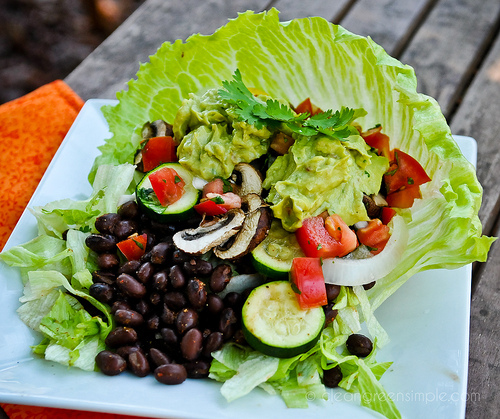 Add your beans, then your roasted veggies, then your tomatoes and guacamole. So delicious! Then just make sure you have some nice spinach or kale for your next meal so the nutrition police don’t come after you, and you should be good to go. Preheat oven to 450 or preheat broiler. 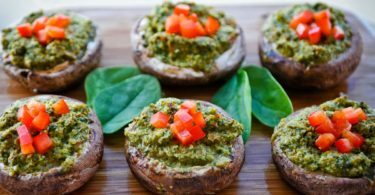 Spread zucchini, mushrooms, onion, and squash out in a single layer and either broil for 10 minutes or roast for 20 minutes (either way keep an eye on them, you just want them slightly softened and browned). While vegetables cook, toss your beans with the cumin, chili powder, salt and pepper and set aside. 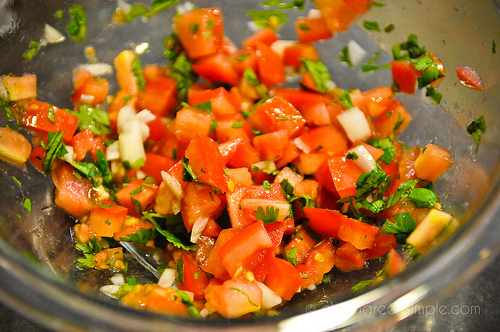 Mix tomatoes, 2 Tbsp diced onion, cilantro, and salt in a small bowl. 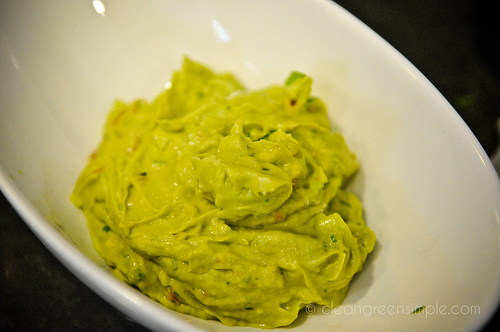 In a food processor, combine avocado and 1/4 cup of tomato mixture and blend until smooth. You could also just mash it with a fork if you prefer. 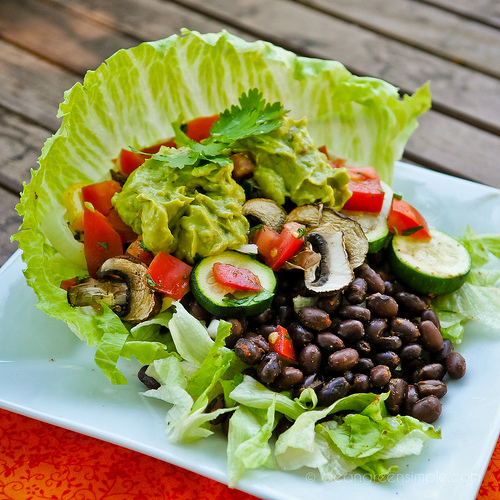 Once vegetables are done, assemble the salad on a plate by adding lettuce, then beans, then roasted vegetables, then tomato mixture, then guacamole. Serve immediately. YUM!!! I love guacamole! Especially YOURS! Wow! 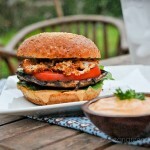 Simple and delicious looking recipe, with an amazing presentation and photos! I will definitely be making this. Thanks! oohhh, this looks so fresh and tasty. your guacamole is gorgeous…it’s all so pretty! I pinned this. I can not stop staring. Gorgeous colors and great idea with the iceberg! omg this is totally mouthwatering!